Our first event is a screening of the documentary film Circle Up, the story of a grieving mother, the men who murdered her son, and the unexpected relationships they create to prevent more violence. Circle Up is a call to action for reframing approaches to crime and punishment through the lens of restorative justice, forgiveness, and accountability. 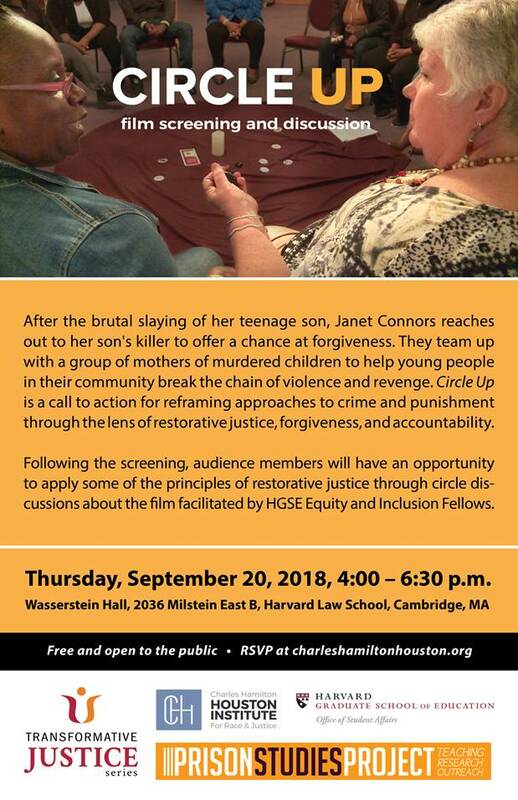 Following the screening, audience members will have an opportunity to apply some of the principles of restorative justice through circle discussions about the film facilitated by HGSE Equity and Inclusion Fellows. In attendance will be filmmaker Julie Malozzi and restorative justice practitioner—and subject of the film—Janet Connors.